Advancement of the Smart-Factory-Approach, so that the supply chain and the manufacturing processes will organise themselves and customer requests will be answered even more efficiently. 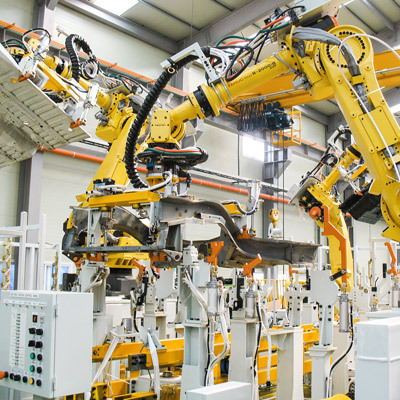 Installation of 600 robots, that are mainly occupied with welding and handling tasks – behind safety fences. Except for one robot – the FANUC CR-35iA - these safety fences are eliminated and the robot is allowed to drive at full speed, in this case at 750 mm/s, to load the manufactured part in a support frame. Simple tasks such as the transportation of parts in the production will be handled by automatic systems, and eventually design work places ergonomically, silently and prevent physical injuries. Ultimate flexibility for your production processes due to location of workpieces and error detection. Several spot welding and handling options can be combined with the help of the R-2000 robot series, plus it offers maximum performance levels and high availability. As the first automotive supplier in Europe, they are using the FANUC CR-35iA in their production in Schwandorf. The robot is allowed to drive at two different speeds in order to be collaborative and simultaneously productive. Schwandorf is one of BENTELER- Enterprise’s 161 locations. In Schwandorf, mainly automotive components are manufactured, i.e. axes- and engine carriers. The competence of BENTLER is not only based on the production. The automotive supplier and development partner supports its clients worldwide alongside its entire supply chain. The strength of the division lies in the deep understanding of light constructional components – related to material, design and processes. Basis for this experience is traced back to the different raw materials such as steel, aluminum, fibre composite and synthetic material as well as the process know-how about customer products. The topic Industry 4.0 has been driving BENTELER ahead for several years now. Hereby, the digitization of the manufacturing processes of the entire supply chain is covered. A goal of the automotive supplier is i.e. to advance the Smart-Factory-Approach. This means that the supply chain and the manufacturing process will organise itself in the near future and customer requests will be answered even more efficiently. The client list of the factory can be read like the table of contents of the IAA (the leading international Trade for Mobility, Transportation and Logistics). Premium producers and luxury-class producers are part of it, too. The reputation and performance of BENTELER in Schwandorf is taken care off by approximately 590 employees and 600 robots. 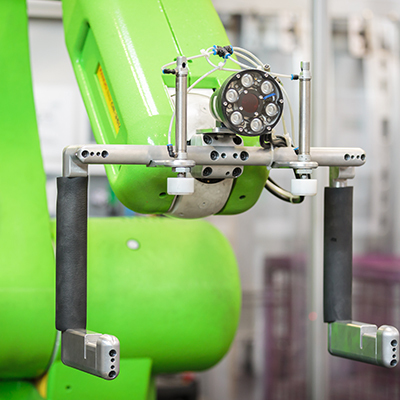 Robots are predominantly occupied by welding – behind safety fences. Except for one robot – the FANUC CR-35iA - these safety fences are eliminated. Amongst others, carriers for safety guards of convertibles are produced. The safety guards protect the passengers reliably in case of an accident. The functionalities of this product are then tested “End of the Line.” Since the carrier system of the safety guards works mechanically, the functionality of each product is testable multiple times. The complete product weighs around 14 kg – manual loading and unloading during the entire shift is highly exhaustive. 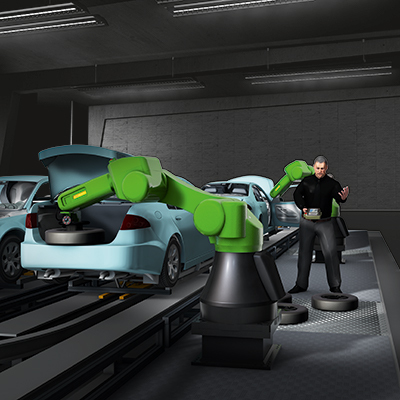 The loading off the testing station and the unloading into a transport rack was the task that Tobias Wolfsteiner, robot expert and project coordinator, accomplished together with the production manager in a “testing field” for the green FANUC robot. In the future, simple tasks such as the transportation of parts in the production at BENTELER will gradually be removed and handled by automatic systems, and eventually design work places ergonomically, silently and prevent physical injuries. Werner Gaisa: „Despite our technology driven nature, the following shall not be forgotten: We must produce automotive parts.“ For testing these parts, the CR-35iA is limited to 250 mm/s. In automatic mode, the robot is able to reach a maximum speed of 750 mm/s. As long as the Laser safety scanners do not detect a person within the environment of the robot, the CR-35iA is allowed to drive at full speed, in this case at 750 mm/s, to load the manufactured part in a support frame. As soon as the robot unloads the part, it is presented to the operator until he has attached the safety labels. Amongst others, the production time is printed on these labels. Currently, the highest payload requested for collaborative robotics is 35kg. 32kg are an easy load for the green CR-35iA. There was no other option in the market. There are several components that weigh more than seven or ten kilograms, “laboratory robots” could not compete. The FANUC robot, which is based on the M-20iA series, has a reasonable reach of 1.813mm regarding industrial applications. Meanwhile, several customers from the automotive industry are interested in the CR-35iA and have requested information about the areas of application. With about 30,000 employees and 161 locations in 40 countries, the BENTELER-Group stands for a high degree of excellent material, production and technology in the areas of Automotive, Steel/Tube and Distribution. The three Business Divisions BENTELER Automotive, BENTELER Steel/Tube, and BENTELER Distribution are organized under the strategic management holding company BENTELER International AG. Continuing progress by means of new materials, technologies, and products as well as long-term, profitable growth are the supporting pillars of the 140-year success story of the BENTELER-Group, which is in its fourth generation of family ownership. BENTELER Automotive provides development, production and services worldwide – while consistently focussing on quality, safety and efficiency. Our products include components and modules for chassis, body, engine and exhaust systems. Our customers include almost all major vehicle manufacturers. In close collaboration with them we develop and implement ideas and solutions with our complete vehicle competence. We have established a global production network which we are continuously expanding. Currently we have 74 plants in 24 countries and 21,326 employees.